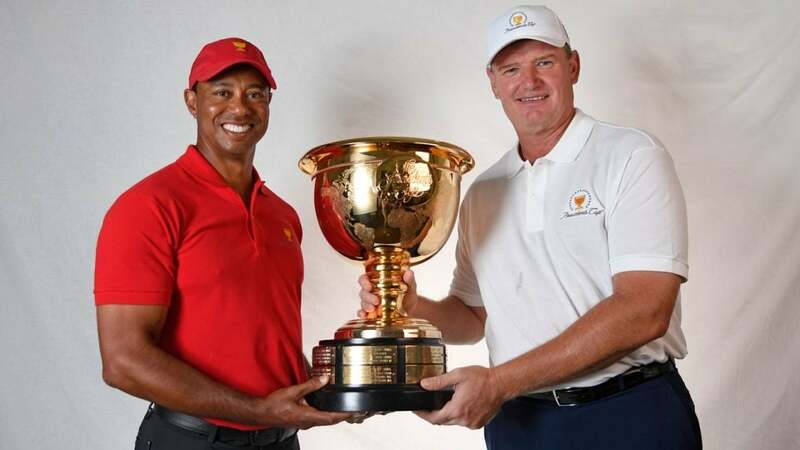 Tiger Woods (U.S.) and Ernie Els (International) will be captains at the 2019 Presidents Cup. Check out the current Presidents Cup standings below. The 2019 Presidents Cup is inching closer and closer, and the Presidents Cup standings are starting to take meaningful shape. Below you can find full Presidents Cup standings for the U.S. and International teams, in addition to everything else you need to know about the event. Tiger Woods is currently on the outside looking in. Woods is 17th on the list with 2,438 points. He improved one position in the standings thanks to his T5 finish at the WGC-Dell Technologies Match Play. You can see the full list of U.S. Presidents Cup standings here. You can see the full list of International Presidents Cup standings here. The Presidents Cup standings are different for each team. The U.S. employs a system tied closely to FedEx Cup points. The eight American players who earn the most FedEx Cup points from the 2017 BMW Championship through the 2019 Presidents Cup will automatically qualify for the team. But not all FedEx Cup points are judged equally. Instead, the U.S. team imposes a weighting system on the points. Each FedEx Cup point earned from the 2017 BMW through the 2018 Tour Championship equals one point in the Presidents Cup standings. Each point earned during the 2018-19 season ending at the 2019 Tour Championship equals two Presidents Cup Standings points. Finally, the last four spots on the team will be selected by the U.S. captain and vice captains. The International team instead determines their players’ standings with the Official World Golf Ranking. The eight International players with the most Official World Golf Ranking points earned from the 2018 Dell Technologies Championship to the 2019 Tour Championship automatically qualify for the team. As is the case with the U.S. team, the final four spots on the International side will be selected by the captain and vice captains. Where is the Presidents Cup this year? The 2019 Presidents Cup will be held in Australia at Royal Melbourne Golf Club. Royal Melbourne hosted the 2011 Presidents Cup and the 1998 Presidents Cup. 1998 marked the only time the International team won the biennial event. When is the Presidents Cup? This year’s Presidents Cup will be held December 12-15, which is early in Australia’s summer season. Who are the 2019 Presidents Cup captains? For the 2019 Presidents Cup, the U.S. team will be led by first-time captain Tiger Woods. He will be opposed on the International side by another first-time captain, Ernie Els. Woods has chosen Steve Stricker, Fred Couples and Zach Johnson as his vice captains. Els tapped Mike Weir, Trevor Immelman, Geoff Ogilvy and K.J Choi to be vice captains on the International team. The presidents Cup began in 1994 as an exhibition team event between an American team made up of U.S. citizens and an International team made up of golfers from outside the U.S. and Europe. It is held biennially, alternating years with the Ryder Cup competitions. The Presidents Cup used to be held on even-numbered years, but the September 11th attacks forced the postponement of the 2001 Ryder Cup by a year. The Presidents Cup followed suit and moved the 2002 event to 2003. The first two Presidents Cups, in 1994 and 1996, were held at Robert Trent Jones Golf Club in Virginia, after which the event alternated between U.S. and International courses. The U.S. team has long dominated the event, unlike their recent performance at the Ryder Cup. The Americans hold an incredible record of 11-1-1. The International team picked up their only win at the 1998 event at Royal Melbourne, the site of the 2019 Presidents Cup. The 2003 Presidents Cup in South Africa famously ended in a tie. Those teams were led by all-time legends Jack Nicklaus and Gary Player. After finishing the event tied 17-17, Tiger Woods and Ernie Els faced off in a playoff to determine the winner. The two stars were still deadlocked after three holes, so, with the sun setting on the South African course, Nicklaus and Player huddled together and decided to share the trophy between the two teams, thus ending the competition. Woods and Els will continue their rivalry as opposing captains at the 2019 Presidents Cup. The Presidents Cup format differs slightly from that of the Ryder Cup. There will be a total of 30 matches worth 30 points at the 2019 Presidents Cup. The matches will be contested over four full days. Day 1 of the competition on Thursday features five foursomes matches, with two golfers per team in each match. Those are followed by five four-ball matches on Friday. Saturday will feature two sessions with a total of eight matches: four foursome matches in the morning and four four-ball matches in the afternoon. Finally, the final round on Sunday includes 12 singles matches. 2009: U.S. wins 19.5–14.5; Harding Park Golf Club; San Francisco, Calif.
2005: U.S. wins 18.5–15.5; Robert Trent Jones Golf Club, Gainesville, Va.
2000: U.S. wins 21.5–10.5; Robert Trent Jones Golf Club; Gainesville, Va.
1996: U.S. wins 16.5–15.5; Robert Trent Jones Golf Club, Gainesville, Va.
1994: U.S. wins 20–12; Robert Trent Jones Golf Club, Gainesville, Va.